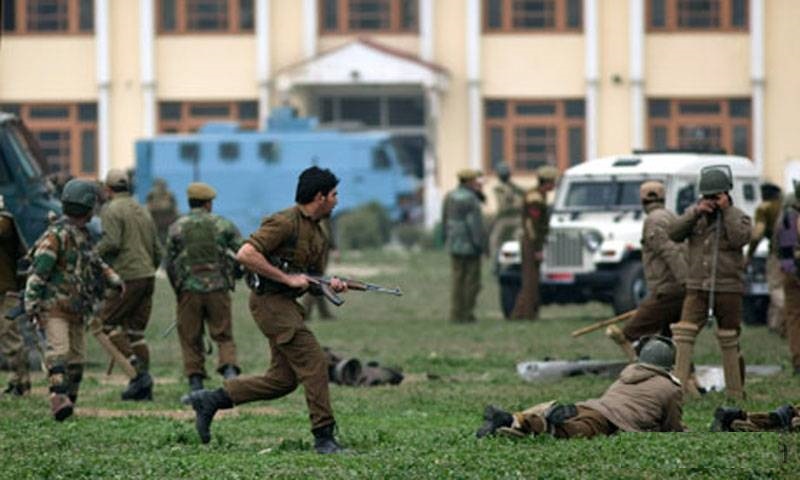 JNN 07 Dec 2014 Srinagar : At least eight army troops including a lieutenant colonel and a junior commanding officer, three policemen were killed after a group of six militants carried out a fidayeen attack on 31-Field Regiment in Mohura area in Uri of Baramulla district in north Kashmir at about 3.30 am. At least three other deadly attacks were launched elsewhere Friday in the region, where local elections were being held through December. At the Indian army camp in the Uri region, rebels hurled grenades and fired automatic rifles as they tried to enter the camp’s artillery unit, an army officer told The Associated Press. Some of the rebels, firing wildly, succeeded in getting into the camp, officials said. The sprawling camp, also the regional headquarters of the army’s artillery regiment, is near the heavily militarized line of control that divides the Himalayan region into an Indian-administered portion and a Pakistan-controlled side. The militants attacked the main gate of the army base with several grenade and intense gunfire. Sources in army said that four army troopers were killed in the initial attack. “The sentries on duty heard the gunshots and challenged the militants who were armed with automatic weapons and hand grenades,” said a senior officer told Valley Media Service. Panic created in area after the sound of blasts, gunfire and local police rushed to the spot but also came under a barrage of gunfire and grenades from the militants. Two policemen died in the attack while as a police officer suffered critical injuries and was airlifted to a hospital where he succumbed later identified as Assistant Sub Inspector Muhammad Akbar, Constable Sanjay Kumar and head constable Abdul Majid. During the initial part of the Operation, one militant opened fire on the vehicles of the Quick Reaction Teams (QRT) of the neighbouring unit rushing to the site, in which one gypsy went off the road and overturned, leading to casualties among the security forces. The militant was immediately eliminated by the troops of the QRT and his body recovered, a defence spokesperson said Valley Media Service in a statement. During the intense operations, one officer and seven soldiers of the Army, one ASI and two constable of the JKP also killed, he added. Many army soldiers received burn injuries after they got trapped in a barrack that caught fire due to militant attack. “Lt Colonel Sankalp Kumar of 24 Punjab Regiment of Raipur was also killed in the exchange of fire besides three other soldiers who were part of QRT,” sources said. “The infiltrators used small arms and followed it with UBGL fire,” an Army officer said. Six AK rifles with 55 Magazines, two shotguns, 2 Night Vision Binoculars, 4 Radio Sets, 32 unused Grenades, 1 Medical Kit and a large quantity of miscellaneous warlike stores were recovered from the slain militants. The Army is continuing the operation in the surrounding areas to search out any militants who may still be hiding or attempting to escape. None of several rebel groups active in Kashmir issued any statement about Friday’s fighting, which erupted two days after a gunbattle broke out in the neighboring Handwara region. Six suspected rebels and one Indian army officer were killed. Also Friday, government forces intercepted two suspected militants on the outskirts of Srinagar, Kashmir’s main city, leading to a brief exchange of gunfire that left two rebels dead, police said. Two police officers were also wounded. Troops cordoned off the area. In the southern town of Tral, unknown attackers hurled a grenade near a paramilitary bunker inside a bus station where an election campaign rally was being held, police said. One civilian was killed and at least six others wounded. Police blamed militants for the attack, but could not say whether the rally or the bunker had been the target. Suspected militants also lobbed a grenade at a police station in Shopian town, but caused no damage, police said. The rebel groups have been fighting against Indian rule since 1989. More than 68,000 people have been killed since that time in the uprising and Indian military crackdown, which also largely suppressed rebel activity. There has been a flurry of recent attacks, however, as the region holds local elections. Indian Prime Minister Narendra Modi has visited twice in the last month, and is due to return Monday to give a campaign speech in Srinagar. The violence was not deterring voters, as election officials said turnout for the first two of five phases was about 70 percent. Police have stepped up security throughout the region, with more checkpoints on major roads and more police patrolling on foot. India and Pakistan have fought two of three wars since 1947 over their rival claims to the territory. India accuses Pakistan of supporting the militants with arms and trainings, while Islamabad staunchly denies this, saying it offers only morale and diplomatic support for their cause. This entry was posted in Asia Pacific and tagged Army, army officer, Indian Occupied Kashmir, Kashmir, Lt.Colonel, militants, Police officer, Police Officers, QRT, Srinagar. Bookmark the permalink.